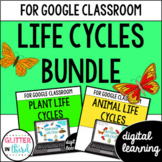 This 2 lesson mini unit comes with a 55 slide power point and 14 printables to really engage your students into the topics of both plant and animal life cycles. 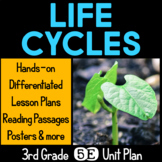 You and your students will love the visuals in the power point and the printable activities that are included in this two lesson mini unit! 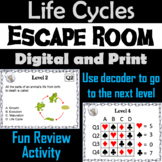 This breakout escape room is a fun way for students to improve their skills with life cycles vocabulary. Full "Letter" sized cards as well as smaller sized cards are provided.Important: Please view the Video Preview (found within the thumbnails above) for an explanation on how to decode the levels. 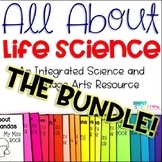 Also included in: Escape Room Science: Human Body Systems, Animal Adaptations, World Biomes, etc. 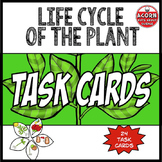 This is an 11 slide Smart Board Interactive Lesson, Drill, and Evaluation of the Life Cycle of Plants and Animals. 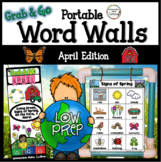 It was created for Grade two, but certainly can be used from grade one through grade five. 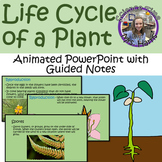 Life Cycle of Plants and Animals are guided notes to use with the PowerPoint presentation on the Life Cycle of Plants and Animals. These notes are aligned with the Florida Test Item Specifications. 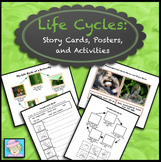 The Six Kingdoms of Life Activity: Plants, Animals, Bacteria, Protists, etc. 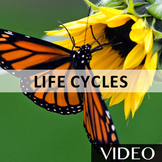 Life Cycles: Plants vs. 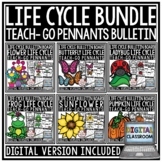 Animals Digital and Printable Versions with links/QR Codes for your google classroom or paper classroom. Fun for all. Color and colorless.